I love, love, love the spinach and feta egg wraps from Starbucks. They are seriously good. I don’t know if it’s because I’m always super hungry when I eat them or if they’re really just that good, but there’s definitely something very compelling about them. I’ll be innocently standing in line, contemplating which sugar-sweet milky water with a touch of coffee drink I’ll be getting and I’ll see the wrap in the case. “Eat me,” it calls out to me in a tiny voice. 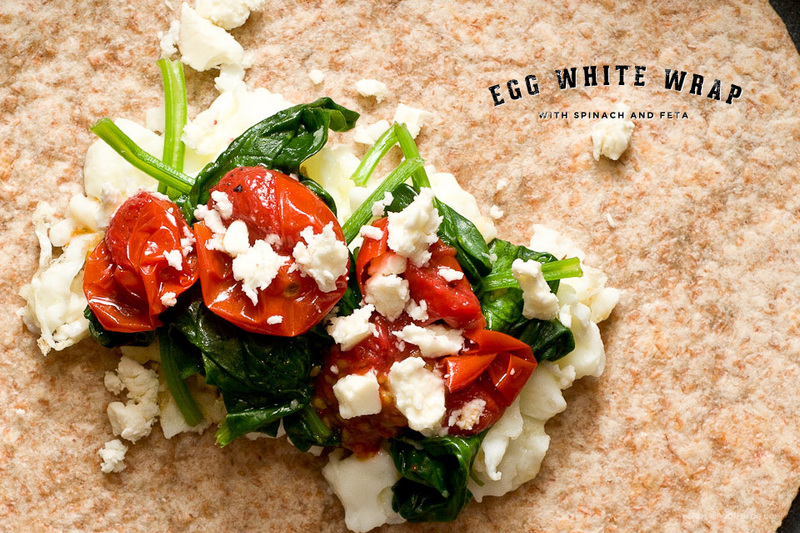 “I wanna join the party…the party in your tummy.” I’m not one to deny entrance to my tummy so I always find myself tacking on a spinach and feta egg wrap onto my coffee order. Sometimes I think I go to Starbucks just for the wrap. Enough is enough though and I’ve committed to making this wrap at home from now on. Does it taste just like Starbucks’s? No. Does it taste supremely good in it’s own right? Yes. It’s definitely joined the party in my tummy a couple of times and from now on, it’s on the guest list. 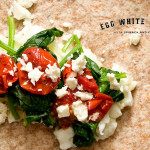 i am a starbucks copycat recipe, i am delicious: i am spinach feta egg wrap! Heat your oven or toaster oven to 350°F. 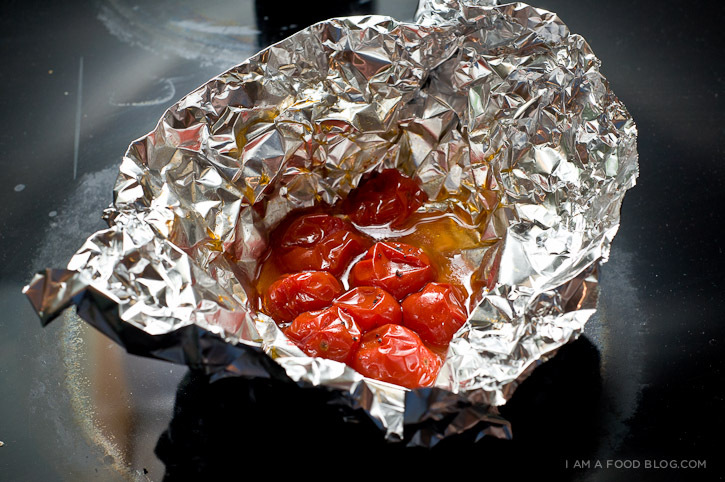 On a sheet of tin foil, drizzle the tomatoes with a touch of oil and season liberally with salt and pepper. Fold the tin foil around the tomatoes like an envelope. Bake for 20-30 minutes. In a small sauce pan, scrabble the egg whites. Set aside. Sauté the spinach in a bit of olive oil. In a dry pan, heat the tortilla over low heat. When soft and pliable, take the tortilla and put it on a cutting board. 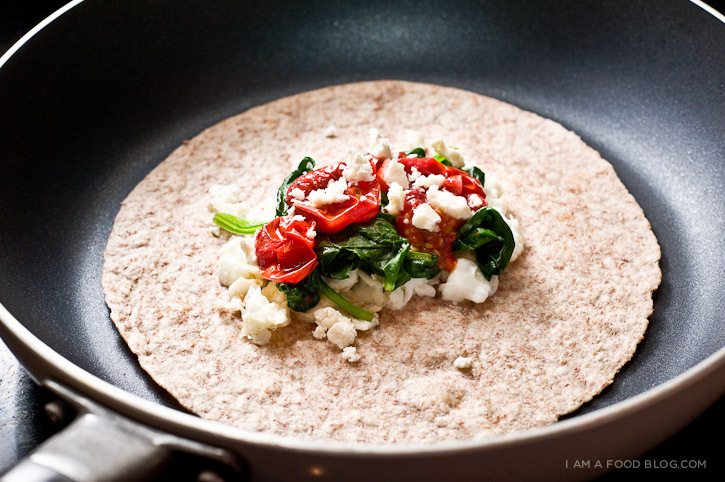 Add the egg white, spinach and tomatoes in the middle. Sprinkle the feta on and season to taste. Wrap and return to the skillet to grill on both sides. Enjoy hot! *you can skip roasting the tomatoes if you’re in a hurry or you can use a couple store-bought sun dried tomatoes. this looks delicious! i’m on a fitness and health kick right now and this fulfills three main food groups- protein, carbs, and vegetables. i’ll definitely be trying this! i never leave comments, but i wanted to let you know that i very much enjoyed your references to yo gabba gabba!. also your food looks delicious. So colorful and healthy looking. Thanks for sharing! This recipe is so YUMMMMY!! Do you think these would freeze well for a grab and go breakfast? will definitely add this regularly as my breakfast. Thanks! Mmm all of these pictures make me hungry. I think I would like this recipes more if it wasn’t feta. The taste of feta is very strong, can you recommend any other type of cheese that is a little less strong but just as yummy? The only thing you’re missing that the Starbucks recipe has is a sun dried tomato cream cheese. 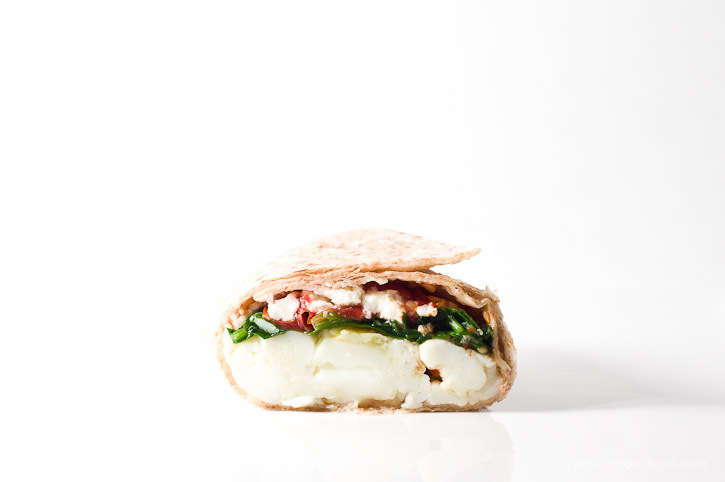 Laughing cow has sun dried tomato cheese wedges that are around 100 callories and are perfect for this wrap! Thanks soo much! :) It tasted delicious! I added a little nutmeg to the spinach but otherwise followed your recipe completely. Enjoy London (UK)! awesome and delicious! substituted sundried tomatoes, and added kalamata olives…served as an appetizer! This tasted delicious. I was surprised that the tomatoes tasted so good as I did not think that the original Starbucks recipe used grape tomatoes – they tasted more like sun-dried tomatoes. However, your version was just as good as the one I had at Starbucks. What herbs are used in this recipe? And yes, I am in love with this wrap!